A Wolf Trap Opera performer responds to Henri Matisse's Studio Quai Saint-Michel (1916) with Stephen Sondheim's I'm Losing My Mind (1971). Photo courtesy Wolf Trap Opera. I was a classical cellist before falling in love with art history, and one of the things that I love about The Phillips Collection is the way art of all kinds is brought together in conversation. In this spirit, the Phillips is hosting singers from Wolf Trap’s bright and talented Filene Young Artists tomorrow at 6:30 pm. 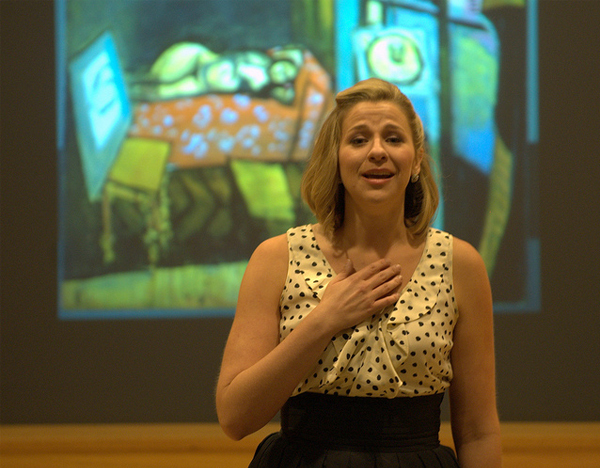 Vocal performances are paired with multimedia presentations of works from the Collection – some highlights include pairings of Schubert with Cézanne and Stephen Sondheim’s I’m losing my Mind with Studio Quai Saint-Michel by Matisse. The vocalists will perform in the Phillips’s lush, Victorian music room, where Duncan Phillips and his brother used to relax while they plunked out tunes on the grand piano, making plans for their budding art collection. Check out some photos from Sunday’s rehearsal! This entry was posted in Experiment Station and tagged cezanne, Henri Matisse, Schubert, Sondheim, Wolf Trap. Bookmark the permalink.